Clearwater, FL – I’m Charlie Westcott, CEO of Militia Products and have been using BobCAD-CAM software since 2008. It’s the only CAM system I will use for machining. When I look back at things I can say I was forced into this business because I was having a hard time communicating my ideas to a CAD guy, and from there to the shop floor it seemed like it would never get done in a reasonable time frame. And so, rolled up my sleeves and got busy. I started out making billet intake manifolds, then machining blocks, pistons, rocker arm stands oil pumps, etc. And here you can see me setting a national record. For those of you that love racing, here’s what things looked like from inside the car! I Bought my first machine, a HAAS VF-3SS in November of 09. I had seen machines like that work at a shop in town and felt that it was time to make the move to CNC. They used Mastercam at the time but I was hoping I could get into a CAM/CNC software program for less than that. I had been designing parts to be machined by others for a couple years prior to this, so I already had my feet wet. After I got my HAAS CNC machine I had to learn mostly on my own how to machine things. I had some help from a friend, but he has a job so his time was limited, and couldn’t help me with everything. 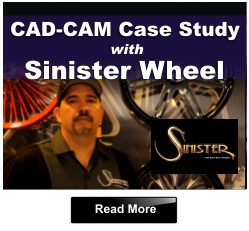 This was where BobCAD-CAM software really helped me get things done faster and easier. In 2011 I bought a HAAS ST-30 lathe new, and used BC to make camshafts, valves, retainers, piston ring grooves etc. This year I put a Landis CNC cam grinder into service. I like the fact that I can think about it, design it, make it, and use it. All on my own. The bottom line is that I started out with no CNC or CAD/CAM software experience. But because I was able to learn through BobCAD’s training videos and watching tutorials after I bought my first version, I was able to achieve what I wanted. I saved a lot of money over what other shops I know were spending, and my ability to take a chance on software ended up paying off big time! Thanks. BobCAD-CAM v26 Mill 5 Axis Pro allows the machine programming of engine ports among the many powerful multiaxis toolpaths. These toolpaths include SWARF, multiaxis roughing and many others all designed to make 5 axis machining easier for complex parts. In addition to all of the 5 axis machining technology is the multiaxis Adaptive High Speed Roughing which is a first for 5 axis milling in terms of CAM programming. BobCAD-CAM also offers full machine simulation in the BobCAD-CAM 5 Axis Mill Pro software allowing for you to use your machines kinematics so that you can see your machine in action prior to actually machining the part on your CNC. 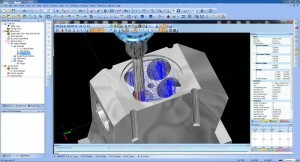 BobCAD-CAM offers powerful MultiAxis CAD-CAM software. This article is about the success iof a BobCAD customer in the racing industry.